Should I use my heat pumps 24 hours a day? No heating appliance should be used 24 hours a day. Common sense tells you, that if you leave an appliance running the whole day, you can expect your power bill to rise. Clever use of a heat pump is using it as required. If you are not at home during the day, there is no need to run your heat pump during the day. In this situation, and with good insulation, a couple of hours in the morning and a few hours in the evening should suffice. For example, when running a 3.5kW heat pump for a couple of hours in the morning and four hours in the evening you could expect to rack up around $40.50 (including GST) in power usage per month. Compare this to running a similar wattage bar heater for the same period of time, which would cost you a whopping $141.75 per month! Can a heat pump be programmed to operate automatically? Yes. Most heat pumps will have a 24 hour timer which allows you to program your heat pumps operation for the day. Mitsubishi Electric offers a 7 Day Controller which allows up to four settings per day. This means that you can plan your heat pump’s operation for an entire week! Ensuring you stay comfortable in your home without wasting both time and money. Furthermore, our optional Wi-Fi heat Pump Control offers even more customised control and monitoring, giving you the freedom to manage your heat pump through your smart phone, tablet or online account, no matter where you are. If I turn my heat pump up to 28°C will it heat the room faster? A heat pump should not be operated like a radiant heater. Turning your heat pump up to 28°C will not make the room warm up any faster. In fact, it will use more energy as the heat pump attempts to absorb energy to achieve this unrealistic temperature. By setting the temperature to what is actually required, say 18-22°C in heating mode (a comfortable temperature during winter), the heat pump will respond in the most efficient way and will reach this quickly and continue to maintain it – without further adjustment. Using a timer to activate this temperature half an hour before you arrive home will mean you return to warm, cosy comfort. All heat pumps will perform a defrost cycle eventually when operating in cold winter conditions. The defrost mode removes ice build up from the outdoor unit. In defrost mode the heat pump stops heating for short periods. Some heat pump brands spend longer in defrost than others. 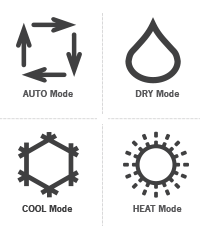 This is part of what makes Mitsubishi Electric Heat Pumps + HyperCore® so efficient, more heating and less defrost cycles. With a Mitsubishi Electric heat pump you get more heat and less defrost cycles, which means less overall power usage and higher, real energy efficiency. Installing a heat pump is a complex process and if it is not installed by a qualified installer, it will most often not be covered under warranty. All Mitsubishi Electric Heat Pumps must be installed by an authorised dealer to qualify for warranty. It is important that you protect yourself by getting your heat pump installed by a professional. Your Mitsubishi Electric authorised installer will ensure you get; the correct heat pump and sizing for your geographical location and space, ensure optimal position of the heat pump, educate you on correct operation and provide a warranty for the system installed. How do I know which size is best for the room I need to heat? Every home is as individual as its owner in its requirements, choosing the wrong size for the room you need to heat can leave you cold and cost you more in power consumption. In winter, when outdoor temperatures drops, the amount of heat a heat pump can produce lowers. Areas of New Zealand that experience sub zero temperatures will require a larger capacity heat pump (compared to a similar sized room in moderate climate) or an upgrade to a high performance heat pump like those in our Mitsubishi Electric HyperCore® Series. Because of the technical nature of correct sizing, we strongly recommend that anyone in the market for a heat pump arrange an in-home consultation and quote, and ensure this is carried out by an authorised professional. To get an idea of the size you will need for your home, click here to access our Heat Pump Selection Tool. If I need to heat multiple rooms in my home, will I need multiple outdoor units? Not necessarily. Mitsubishi Electric offer multi-room systems (sometimes called multi-split systems). To achieve a warm home, you will often require more than one heat pump to effectively heat your whole home. A multi-room solution gives you the freedom to choose the most suitable heat pump for each room, i.e. super quiet heat pumps for bedrooms and larger capacity units for living areas. The great thing about multi-room, is that up to eight indoor units can be connected to a single outdoor unit. So, you are not disturbing the outdoor aesthetics of your home. Correctly selected and installed multi-room systems can save you power and reduce extraneous noise. Find out more about Mitsubishi Electric Multi-Room Systems. Does a heat pump prevent condensation? While a heat pump’s primary purpose is to heat or cool your room, our heat pumps do offer limited dehumidification using “DRY” mode. It is important to note that when the heat pump is operating in Dry Mode, the unit is not heating so it is recommended to only use the Dry mode for shorter periods of time and when heating is not being required. While good airflow does help to prevent moisture build up, specialist moisture control products such as the Mitsubishi Electric Lossnay Home Ventilation System or a Mitsubishi Electric Oasis dehumidifier may be required in homes to specifically address excess moisture concerns or issues. Can I upgrade my current heat pump system easily? Replacing heat pump units used to mean replacing all the piping as well. But now, Mitsubishi Electric has developed a remarkable refrigerant oil that cleans out leftover mineral oil from the old type refrigerant in the existing heat pump piping, allowing the piping to be re-used. This pipe reuse technology will save you both money and time when looking to upgrade. Added to this, it prevents waste and reduces the need for copper. Upgrading your old heat pump unit to a more energy efficient model makes more sense now than ever before. How often should I clean my heat pump? Cleaning your heat pump regularly ensures optimum operation efficiency and reduces unnecessary power consumption. We recommend cleaning your heat pump as often as every two weeks in order to utilise its full performance. Cleaning your heat pump is quick and easy, with Mitsubishi Electric’s quick clean kit. How to change from cooling mode to heating mode or heating to cooling? If the MODE symbols look different on your remote from those above, please consult the user manual for your specific air conditioning model.